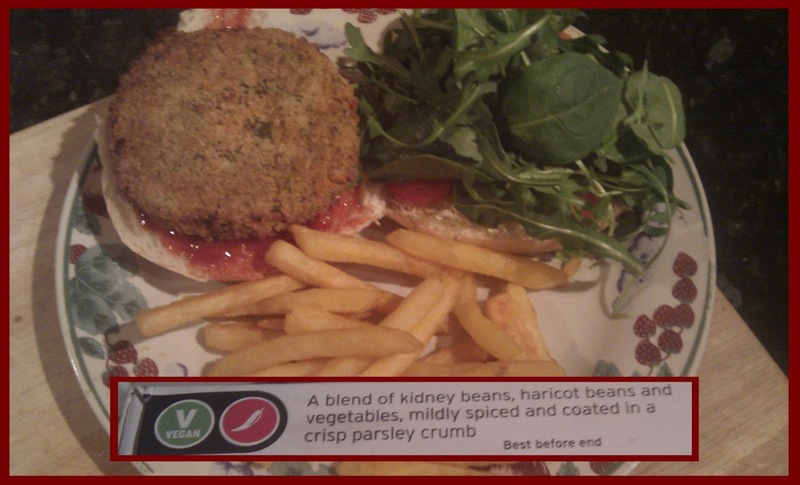 It's time for another food review and this time I cooked Sainsbury's Spicy Bean Quarterpounders. Once again Sainsbury's have created another vegan friendly food which is labelled suitable for vegans. The product description states "with red kidney beans and vegetables, mildly spiced and covered in a crispy crumb." Now you all know by now, that hubby is an avid meat eater and would NEVER EVER consider turning vegetarian let alone vegan, but even he ate and enjoyed these! I was ravenous when I got home tonight and I needed something fast, easy and most importantly tasty! On opening up the fridge I had some Redwood Cheezly that I'd used sometime back and needed using up and in my crisper box was an odd courgette, a red pepper, a couple of mushrooms. 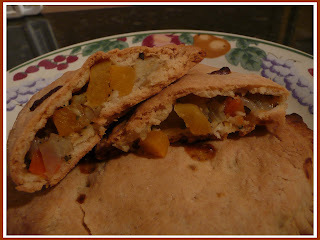 I also had 2 pitta breads that needed using up. The others had been filled with houmous, falafel and salad for lunches. And so pitta bread pizza was born purely out of hunger! Coat one side of each pitta with the tomato passata. 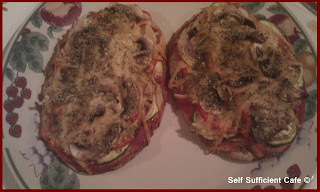 Finely slice the onion, courgette, red pepper and mushrooms and layer them on to the tomato passata in that order. 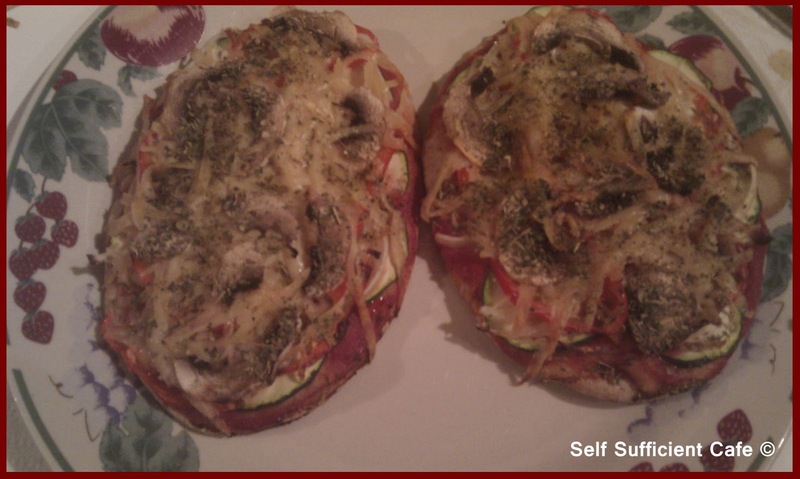 Grate the vegan cheese of your choice over the vegetables and sprinkle with the mixed herbs. Bake in an oven until the 'cheese' has 'melted'. Careful not to bake for too long as the pitta breads have a tendency of going hard and therefore difficult to cut saw through! For the first time in ages I had not prepared my lunch and snacks to take to work today and as luck would have it I overslept too! Normally in the morning I have just enough time to walk Marco, get showered and dressed and pick up my work lunch and snacks before heading off out the door. If I'm lucky I manage to grab some marmite on toast but more times than not my breakfast is prepared the night before and eaten when I first get to work. Today I had not prepared my lunch, snacks or breakfast and I had got up late! 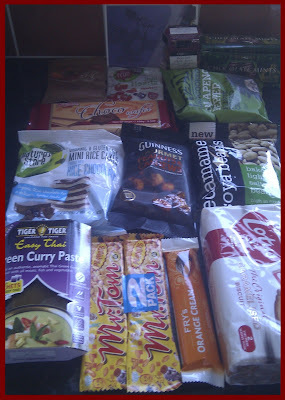 What is a girl to do apart from panic as we all know how hard it is to find vegan food on the go. Especially in my home town, you have to be super organised. Thankfully I had prepared a big bowl of fruit salad a couple of days ago and some of that was left so that was packed up for breakfast. 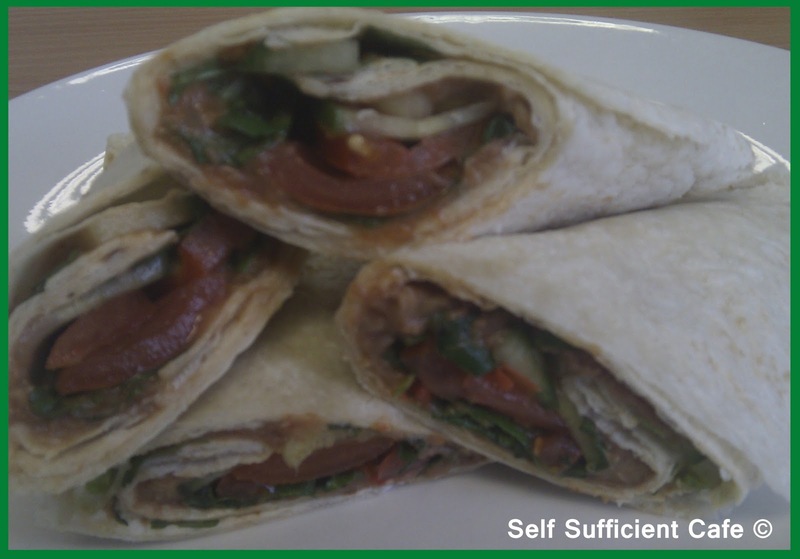 I had a couple of tortilla wraps that needed using up so they were an obvious choice. I had no houmous, pesto, falafels or ready to heat filing for the wraps so my trusty food cupboard was raided. Woohoo! I had a small tin of refried beans. I spread this over the tortillas and topped with salad leaves, sliced cherry tomatoes and cucumber. Before folding in the sides and wrapping I drizzled some sweet chilli sauce over the top. I didn't have time to photograph the finished result before leaving for work so I took a photo at work at my desk, my colleague wondered what I was doing! Cook diced mixed vegetables in a saucepan of boiling water (salted if desired) and boil until soft and still keeping their shape. Drain and rinse with cold water to stop cooking process and drain once more. Fry the diced onion, celery and garlic in the olive oil until translucent, add the stock in batches and reduce each time. Sprinkle over the herbs and flour and stir until all combined and cook through over a low heat for a minute. Add the soy milk stirring constantly, the mixture will thicken. Once the mixture is to your desired consistency add the drained vegetables and stir until all is combined. Leave the mixture to cool a little before adding to the pastry. I cut out discs using an upturned bowl and added a little filling to the middle before folding the pastry over to form a pasty shape. Wet the edges with a little soy milk to help them stick and press a fork into the edge to make a pretty indentation. Bake in an oven about 180°C for about 20-25 minutes or until golden brown. * I didn't weigh the vegetables (doh!) but I reckon there were about 4 cups worth. The verdict – Hubby had one and asked for another – unbelievable! The other day I posted the recipe for Get Well Soon Stroganoff and I said I would post my Mushroom Stroganoff recipe as I still had some soy cream left. So true to my word, here it is! I don't think I'll ever get tired of eating this. I hope you enjoy it as much as I do. Finely chop the onion and garlic and saute in a little olive oil until the onion is translucent. Slice the mushrooms and add to the pan with a little soy sauce to prevent them from sticking. Once the mushrooms have released their liquid add the paprika and thyme and stir to combine. Next pour in a glug of brandy and if you're feeling professional tilt your pan and set the alcohol alight! Or, if you're a danger in the kitchen, continue to cook the mushroom mixture until the liquid has reduced. Add a little water if the mixture starts sticking, and continue to saute until the mushrooms are cooked. Add salt and black pepper to taste. Slowly add the soy cream until you reach your desired consistency. I used about ½ a carton and heat through, do not boil else the soy cream may split. Serve over rice or pasta. Or if you're feeling extravagant serve in a bowl with sides of french fries and peas. Enjoy! 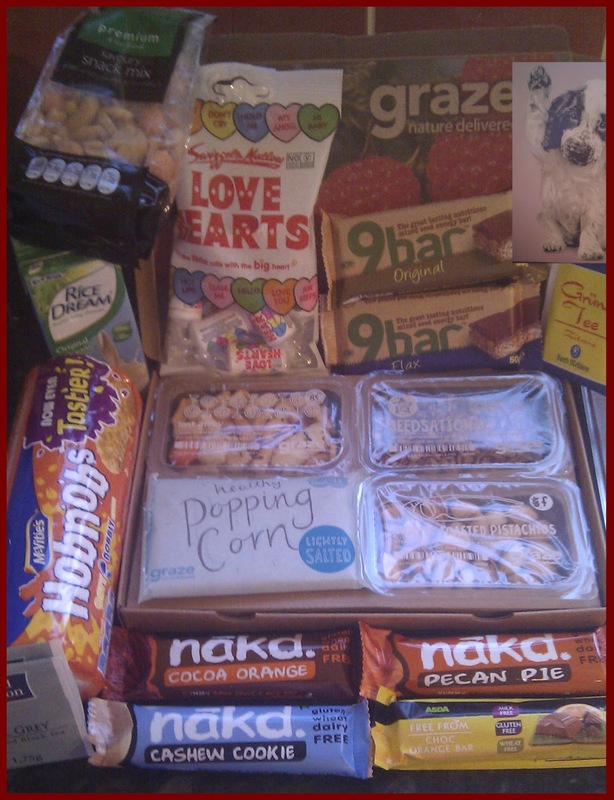 This month was my first vegan swap box which the to happy vegans organise every month. I was super excited at sending a swap box and even more excited to see what I would receive. I ordered a graze box to send and this was made up with a sachet of lightly salted popping corn, lightly toasted pistachios, seedsational (roasted sunflower and pumpkin seeds roasted with soy sauce) and lost army (a classic rice and peanut cracker mix). When I first went vegan I had a mentor that was set up by the vegan society and she told me that original hobnobs were vegan. I was amazed and I always have a packet at hand for those emergencies! Another good stand by is the packet of savoury snack mix. I also included two "9bars"; original and flax as well as 3 "nakd" bars; cocoa and orange, pecan pie and cashew cookie. My favourite is the cocoa and orange version which I am going to have a go at making myself sometime soon. 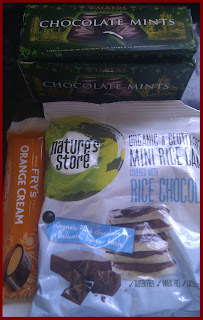 To top off the naughty but nice I included a packet of little love heart sweets and ASDA free from choc and orange bar. To balance all the naughtiness out, I added a carton of rice dream, a milk alternative that I use quite a bit in my cooking and 2 earl grey and 2 green tea with lemon tea bags. I hope Bindy enjoys the swap box, I enjoyed putting it together. Yesterday I posted the Get Well Soon Stroganoff I made, and today I enjoyed some leftovers over a baked potato. It tasted even better today and was a fine accompaniment to the spud! I still have some soy cream left over and need to use it up so in a day or so I will post my Mushroom Stroganoff recipe, it tastes divine even if I say so myself! 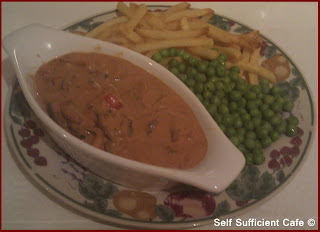 I remember one of the first meals I had out in a restaurant when I turned vegetarian at 15 was Mushroom Stroganoff. I'll never forget that first mouthful it blew me away. I just knew I had to veganise it as it was one recipe that I couldn't do without. I honestly think mushrooms are my favourite food. What are your favourites? After two weeks of going to hospital and mixing with all the bugs flying around I was bound to fall ill, wasn't I? I was tired from trying to fit work in after an 8 hour shift at the hospital and then organise and cook tea for two people who eat at differing ends of the spectrum! Don't get me wrong friends had offered to help with shopping, cooking, cleaning and dog walking, but I thought I was Wonderwoman and tried to do everything. The result was falling flat on my face with a cold and chest infection! I didn't want to surrender to it but there was no way I could carry on visiting S while I felt this poorly and besides I didn't want to pass on the illness to S, she has enough on her plate at the moment fighting Guillain Barre Syndrome. I figured I needed some good honest healthy vegetables and herbs and put together Get Well Soon Stroganoff. Finely chop the onion and garlic and saute in a little olive oil until the onion is translucent. Finely chop the green beans and add to the pan, saute for another 5 minutes stirring all the time. Finely chop the red pepper and add to the pan, with a little soy sauce to prevent the vegetables from sticking. Add the paprika and thyme and stir to combine. Add a little water if the mixture starts sticking, slice the mushrooms and add to the pan and continue to saute until the mushrooms are cooked and the green beans are al dente. Shred the spinach and add to the pan, stir through the vegetable mixture until the spinach wilts. Add salt and black pepper to taste. Slowly add the soy cream until you reach your desired consistency. I used about ½ a carton and heat through, do not boil else the soy cream may split. Serve over rice or pasta. I enjoyed mine in a bowl on its own, the flavour of the vegetables worked really well together, with the herbs and soy cream. I decided not to post about the vegan swap box that I sent to Bindy as she has yet to collect the parcel from the post office and I didn't want to spoil her surprise. I was so excited to see that my vegan swap box had arrived, and I couldn't wait to open it to see all the goodies. But first I put the kettle on, you never know there might be something I can dunk! I wasn't let down! 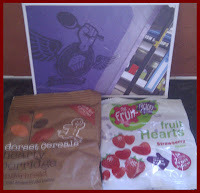 Caroline from Tea and Sympatico had sent me a fabulous box full of goodies and I shouldn't have put the kettle on as the parcel even contained tea bags! It brightened up my day no end, thank you Caroline! The picture doesn't give the goodies justice so as I write about each of the items I have more photos, so you can see how much time and effort went into this swap box. The first thing to go was the chocolate mints, similar to after eight mints but vegan, although under the ingredient list it did state that there may be a contamination risk as they were made in a factory that uses milk. They lasted about 10 minutes! Hubby and I gorged our way through them whilst watching a film! The next thing to go was the choco wafers and I am just eating the last one whilst I am writing up this blog. They are very much like Kitkats without the chocolate round the outside. They are extremely tasty, you just have to keep going back for more! And yep hubby helped me eat these too! In fact its given me an idea I might try cooking with fake meats for his tea, he probably won't know the difference. I'm not one however to indulge in the fake meats as I don't want to be reminded of what I gave up by choice. But everyone is different and cooking with fake meat will be better than what I do at the moment for him! Next to be demolished was the Fry's Orange Cream and I enjoyed every mouthfull! It was pure heaven, I can't believe it's vegan. This is going to be dangerous as soon as I find somewhere that sells these I'm buying boxes of them! The mini rice cakes were also nice, not something I would have considered before but this is the good thing about the swap box system you get to try things that you wouldn't normally. I got into quite a bit of mess eating these and lots of rice crumbs were hoovered up by Marco! I think he enjoyed them more than me and he didn't have the chocolate bits! I've yet to try the jalapeno pepper crisps, but reading the ingredients, they're going to be hot! 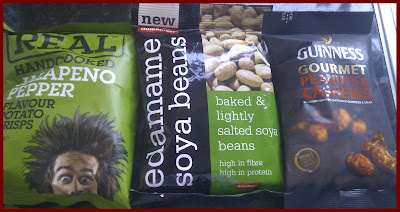 No doubt I'll tuck into the soya beans & gourmet nuts sometime soon. I've never heard of some of these makes and never seen anything like it in our small home town. Next time I'm in one of the 3 supermarkets in our town I'll start reading the ingredient labels on a heap load of more foods! 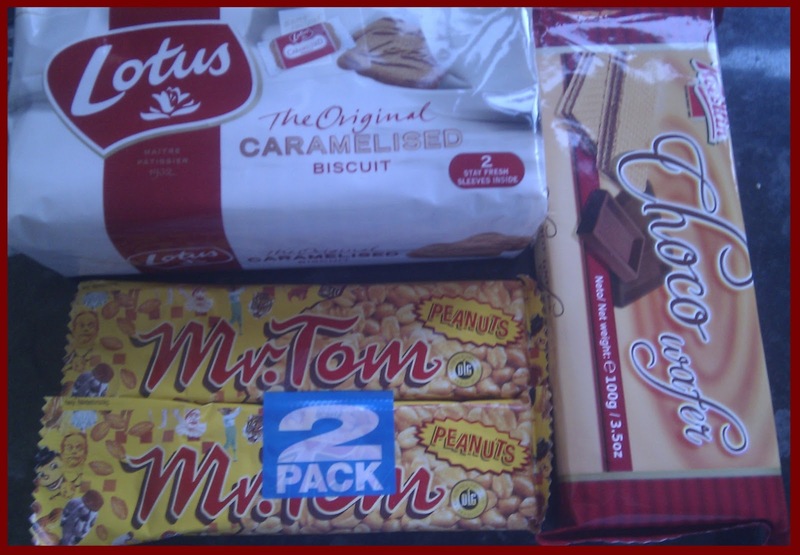 I'm guessing the "Mr Tom" Peanut bars taste a bit like a snickers without the chocolate! The Original Caramelised Biscuit by Lotus looks like a good dunker! 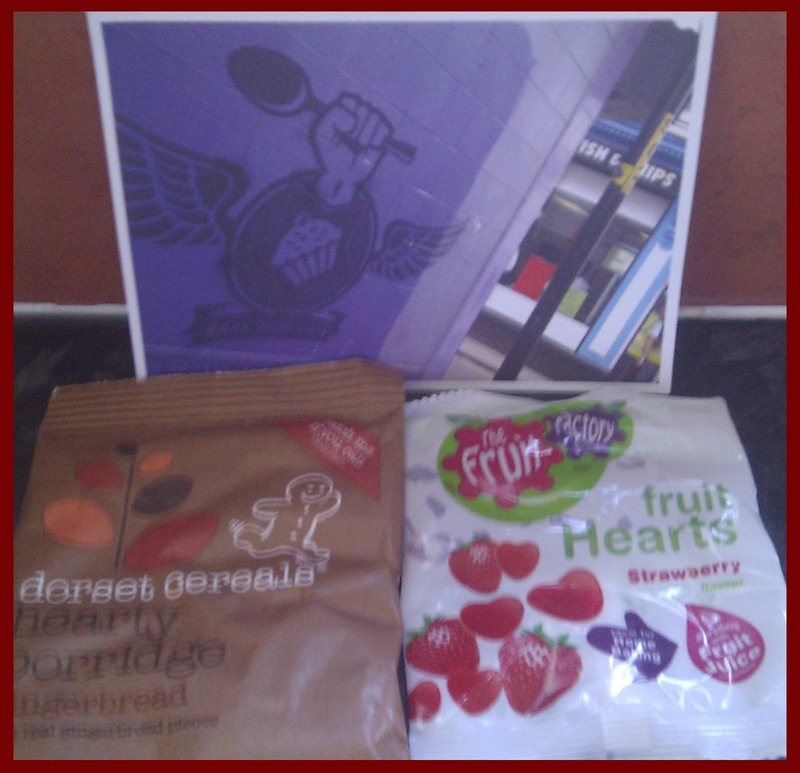 One Morning soon I'll try out the porridge and I'm not quite sure what to do with the fruit hearts yet. The packet says they are ideal for baking, I'll have to get my thinking cap on with this item. Or I could just eat straight from the packet when I need something a little sweet! Caroline had written a lovely message on 'Cake Liberation' postcard, which she is a member. They meet every couple of months in Manchester, go check out their website. 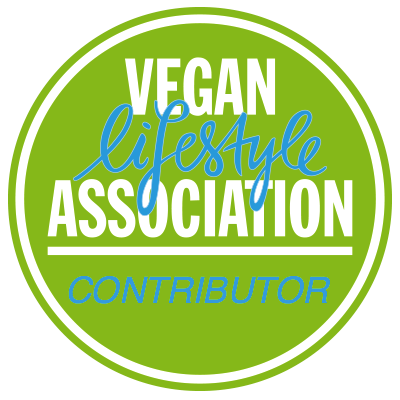 The group is for anyone baking or cooking without animal ingredients and when they get together they swap recipes and sample each others food. Sounds like a great get together if you ask me! I wish I lived nearer! The last two items (not including the lovely tea bags Caroline had included) were Easy Thai Green Curry Paste and Mexican Chilli Bean Deli Filling. 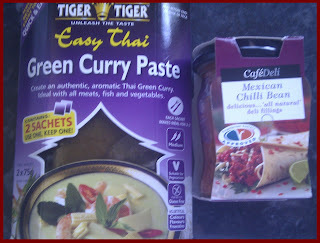 Two things which I can use to make super quick tasty meals, as I get in from the hospital and/or work. Last but no means least, Caroline included 4 different flavoured tea bags. How did she know I was a tea enthusiast! I've got Twinings Rose Garden, Good Earth Organic White Tea, Dragonfly Organic Cape Malay Rooibos Chai and Ahmad Tea Rooibos and Cinnamon. Overall it was a fantastic swap box and I look forward to trying and eating and drinking everything in it! Thank you Caroline! Tomorrow I'll post what I sent to my swap box buddy. Have a good day! 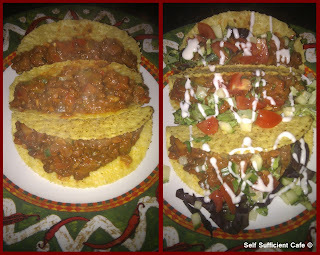 As promised my taco recipe and yet another Mexican night! I love Mexican food, I must visit the Country, although I have heard that the food is nothing to what we class as Mexican here! A bit like Chinese I suppose. 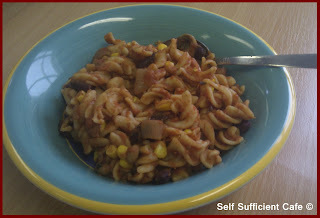 This was ready in half an hour so don't be put off with the ingredients and length of the instructions! 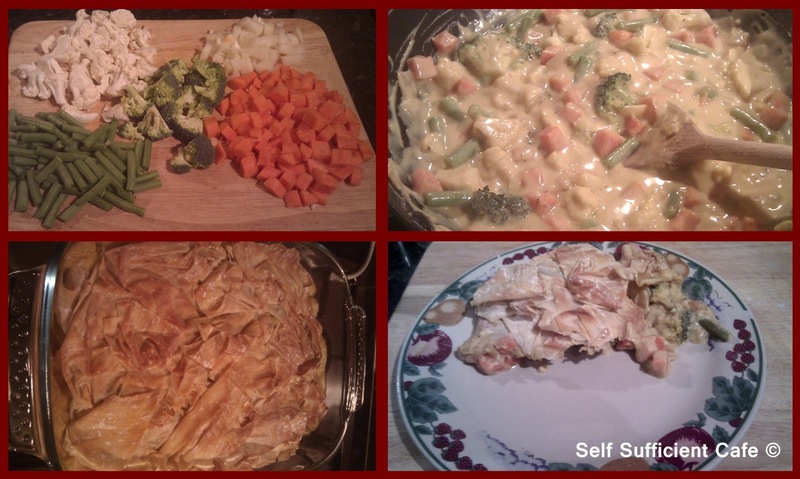 It was extremely tasty and one recipe I will repeat over and over again now I've written down what I actually did! Before writing this blog I could never remember what I cooked up all I remembered was "that tasted GOOOOOOOD". This blog is a good record of what I get up to in the kitchen when my creative juices are flowing, so I can go back and recreate the tastiest of all my recipes. Saute the onion until translucent then add the garlic and saute for a couple more minutes. 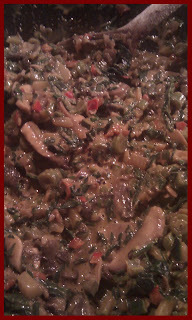 Add the celery and red pepper and saute for another couple of minutes before adding the courgette and mushrooms. When the mushrooms have released their liquid add the spices and stir to combine. Add the refried beans and stir through so they are evenly distributed. Add the mixed herbs, black pepper, paprika and cumin to the soya mince and stir to combine. Add the boiling water and leave to sit for 5 minutes. Mix thoroughly and add to the vegetables. Simmer for another 5 minutes and serve with taco shells, lettuce, tomato and cucumber. I also add some vegan mayonnaise which you can see in the second photo. Well, as you are aware I haven't been publishing any posts for 2 weeks, that's because a very close family member (S) has been in hospital on the critical care ward and I have been spending most of my time at the hospital and trying at the same time to go into work for a couple of hours. Which meant once I was home all I was good for is a quick bite to eat and bed! Thankfully S is getting better and we are not needed as much at the hospital. I'm also on annual leave this week so I'm planning to cook up a storm in the kitchen too. I'm ashamed to say it but for the first week I lived off ready salted crisps and dry roasted peanuts! Hospital canteens really don't cater for vegans! But the second week I got better organised and prepared my lunch whilst cooking tea. Thank goodness for falafel! 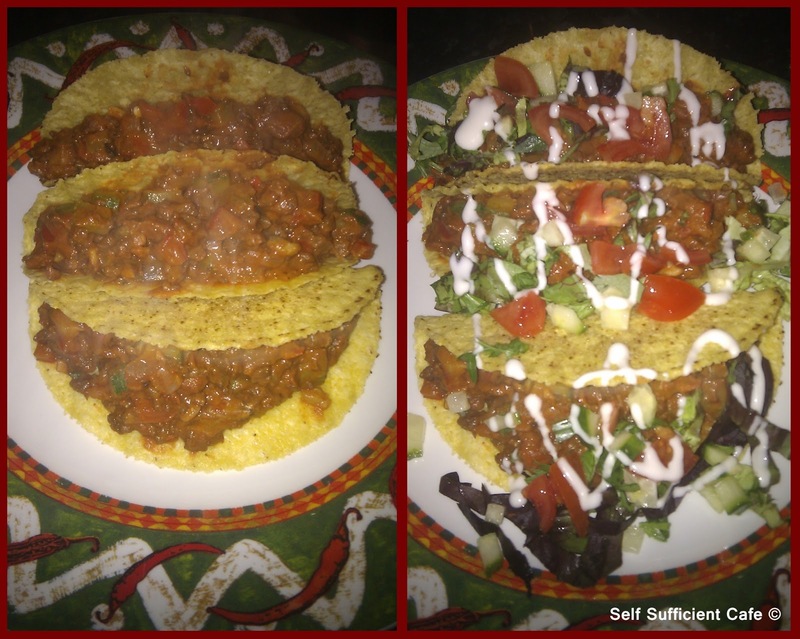 Next recipe to follow - Taco's! One night after a long day at hospital and then work I really craved something hot and spicy and the Tacos just fitted the bill. Tonight we were tired and hungry and if not on a budget would have picked up the phone and ordered a take-away. We are lucky that there is a good Cantonese Restaurant not far away and they do deliveries. We were craving a Chinese so using store cupboard ingredients we rustled up just that. 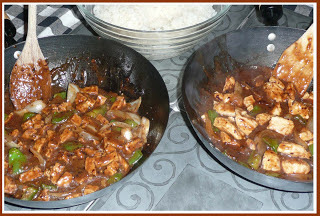 For me Tofu and Green Peppers in Black Bean Sauce and for hubby, Chicken and Green Peppers in Black Bean Sauce. We resorted to boil in the bag rice, a jar of Black Bean Sauce from Lidl and added onions, green peppers and either tofu or chicken. We have two woks in our house one each, they're engraved with a "V" or "M" so we don't get them mixed up. So we cooked (or should I say heated up) the meal together. It was ready within 15 minutes and it was very tasty! I was in the mood for cooking up a storm, the slow cooker was on for hubby's tea (this piece of equipment is an absolute god send for cooking his food. I just throw the ingredients in and turn it on)! 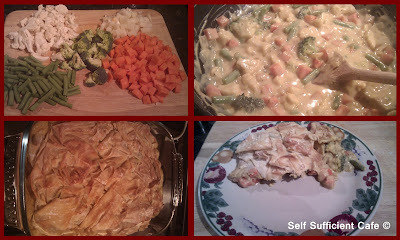 I fancied something that was full of vegetables with a creamy sauce and this is what I concocted, it was very tasty, filling and filled the craving. Turn on your oven to 180°C. Dice the onion and carrot and cut the cauliflower and broccoli into small florets. Saute the onion in a little olive oil for 3 minutes and add the rest of the vegetables. Continue to saute until the vegetables start to go soft. Add the thyme and mustard and stir to combine thoroughly. Next add the flour and stir to combine, cook for a couple of minutes. Slowly add the milk whilst stirring until all the milk has been added. Next add the nutritional yeast and stir through the mixture. Slowly bring to a simmer and the mixture will start to thicken. Add salt and pepper to taste. Try a little and add more mustard, nutritional yeast or salt and pepper to your desired taste. Spoon into a baking dish and lay the filo over the top creating waves in the pastry. Bake for 20-25 minutes in the oven. Whilst the pie is in the oven boil some potatoes ready to mash to serve with the pie. If you're a reader of my blog you will remember I enrolled on a 10 week course on aromatherapy, and I pleased to announce that I passed with flying colours. I thoroughly enjoyed the course and I am seriously considering doing a full time course (over a couple of evenings a week) so I can become a fully qualified aromatherapist. I am confident with the oils that I have purchased and I am able to blend the oils to help promote a more balanced lifestyle, reduce stress and reduce the chance of everyday illnesses. However, without the relevant qualification I cannot continue my journey and become a practitioner. I'm not sure if that's where I want to be yet but it can't hurt opening more doors for the future can it? I need to start saving! Courses these days are not cheap are they? I use what I have learnt almost every day and I always have an oil burner lit to either help me relax or increase my concentration. I've also made cleaning products, hand creams, body moisturisers, liquid soap, bubble bath, room spray's and my own pot pourri. I made a few creations for Christmas presents and I've received some good feedback which is always encouraging. The most popular was the sleep easy pillow spray I did, which has helped a few people I know. Encyclopedia of Essential Oils: The complete guide to the use of aromatic oils in aromatherapy, herbalism, health and well-being. Let me know if you decide to learn more and we can swap stories. Have fun! Just a quick post tonight as I'm off out with friends, something is better than nothing right? You'll remember the three bean chilli I made (and I made a lot) which hubby renamed cowboy stew. 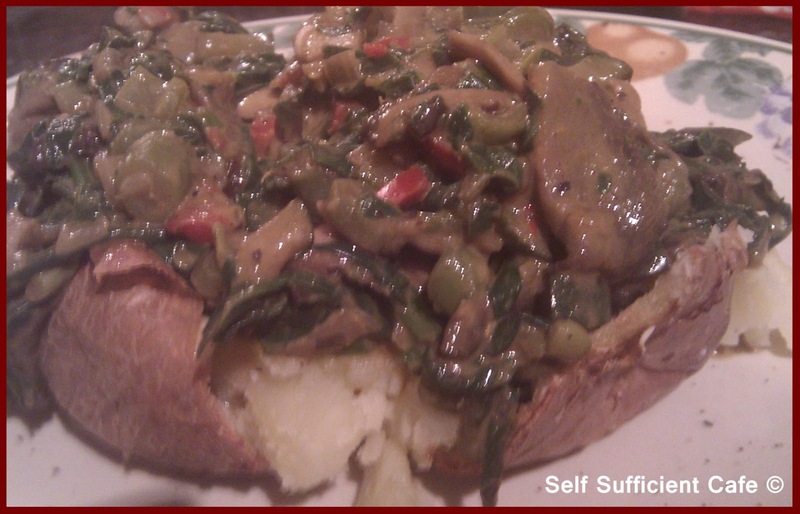 Well, even after the chilli and the cowboy stew topped jacket potato, I still had some left. It wasn't a vast amount so I heated it up and added a small carton of passata and some sweetcorn and mixed it through some pasta. It was great heated up for lunch today!